J&B Medical Supply provides medical and surgical products to patients, caregivers, health systems, clinics, and first responders. J&B turned to SmartAction’s AI-powered virtual assistant service to automate the repetitive conversations handled by their live agents. After automating several different call types like patient authentication at the front end of every call, repetitive call types (i.e. checking on an order) with live agent failover, and complex outbound calls to reorder supplies and handle collections, J&B Medical Supply is now automating 75,000 conversations that used to be handled by live agents. Like any Healthcare company that handles personal information, J&B is bound by HIPAA regulations and therefore has a complex three-factor authentication process for all callers. Since many of the patients that J&B serves are unable to make calls for medical reasons, the typical call could be from a caretaker, nurse, or other family member. This creates challenges when callers do not have the correct information, or do not have the information readily available. This was causing long authentication times, and generally took agents more than three minutes to complete. Once authenticated, callers were often checking on orders, reordering supplies, or checking on coverage paperwork. These are complex processes required for DME suppliers, specifically those that rely on payors to earn revenue, and agents were the only option for providing customer service. Moreover, J&B found it difficult to retain agents and expensive to hire, train, and retain new agents. Unable to sustain their agent churn in the Detroit area, J&B had to turn to an outsourcer to help offload call volumes. In cooperation with J&B’s Customer Service Team, SmartAction refined and perfected an automation approach that was comprehensive, HIPAA compliant, and incorporated industry best practices that J&B’s agents had been using. The authentication self-service solution triangulates three pieces of patient data out of a possible six to eight, and uses these data elements to positively identify the caller. Since some of the data points are not always top-of-mind (i.e. 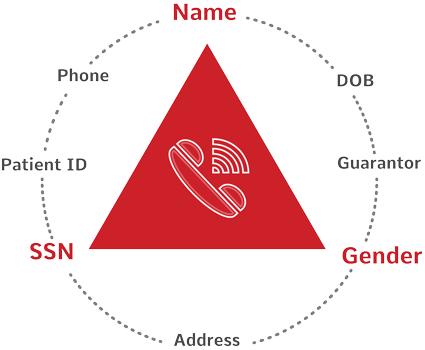 Patient ID), the system asks for one of two data elements at the same time to increase the odds that the data being requested is something the caller knows. When a caller does not have some piece of information, the AI-powered engine can move on to ask for a different element. Please tell me the patient’s phone number or Patient ID. Ok. Let’s try something else. Please tell me the patient’s zip code. With SmartAction’s cloud-based conversational AI service that automates complex, repetitive tasks, J&B was able to limit their reliance on live agents, save costs, and stimulate growth to reach their lofty expansion goals. Better yet, the distributor could offer 24-hour self-service for many of the common tasks that patients were calling about, like order status, reorders, authorizations, and making payments. In just a few short weeks after going live, callers were engaging with self-service automation on 96% of calls, and almost ¾ of those callers were fully authenticated without being transferred to a live agent. Callers who were not fully contained within SmartAction’s AI-powered automation were seamlessly transferred to live agents as a failover. Any data that had been gathered was passed along to a live agent to ensure a pristine customer experience. J&B was amazed to discover that self-service authentication took less than half the time it took agents, reducing handle times by over two full minutes. By automating approximately 75,000 agent calls per month, J&B experienced a 65% cost savings to their call center. With so much call time offloaded from the call center via AI-powered automation, J&B Medical Supply no longer had to suffer the heavy expense of agent churn related to new-hires and training, nor did they need to outsource any of the work. Due to the normal course of live agent attrition, J&B Medical Supply was able to retain their most valued agents and get better use from them by focusing their efforts on overtly complex conversations beyond automation. Given the elderly demographic and the perceived reluctance this population would have in talking to AI-powered automation, the successful deployment proved to J&B Medical Supply that AI-powered customer self-service could make an impact on every aspect of the patient experience. In addition, by building out these use cases for AI-powered voice automation with SmartAction, J&B now has the option to scale their solutions to web chat, SMS text, and other digital channels as needed.